Parenting is probably the most important job in the world. Bringing up the world’s future is no light matter. Children soak up much of who they will become from their guardians, therefore we should think deeply about what we are pouring into the lives of our future generations. Even when we think they are not listening, they most likely are, even when we thinking they aren’t paying any attention, they most likely are absorbing our behavior like little sponges. Children are usually always listening, and they are almost always paying great attention to our actions as adults, including how we treat one another. Like the old saying goes “The apple doesn’t fall far from the tree”, and “children are a reflection of their parents”. It is very true that there will come a time when a child becomes an adult and must stand responsible for their own choices, good or bad, but shouldn't the world of parents be about pouring more generously into the lives of these future adults. One department that parents/guardians can pour more generously into is education. Parents should be involved and concerned with in every aspect of education from lessons they learn at home to the education they are receiving in the public education system. All the teaching should not be left up to the teachers in your child’s classroom. What you teach your child at home about manners, respect, self-esteem will ultimately affect your child’s performance during school hours. Understand and be encouraged as parents/guardians that you do make a difference and your voice does matter. 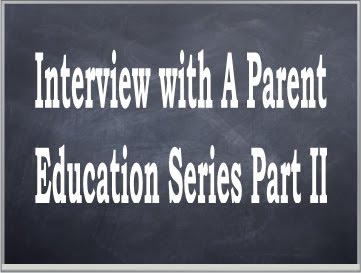 To go along with the education interview series I ask a Mother of two Mrs. Toni (Sells) Ferrell of Allons, TN to share her views on education, parenting, and how one directly relates to the other. Question: What grades are your children in? Question: Do your kids seem to love/hate or have no feelings about school in general? Answer: Both of my kids generally like school however my youngest is hardly as excited about school as my oldest. Question: Do you think we are expecting too much out of our children these days? In other words, forcing them to grow up too fast and rob them of some of their childhood? Answer: It does seem like children have more worries and responsibility than I remember having at their age. When I was 10 I don’t remember worrying about half of the things my 10 year old worries about. I think school was less stressful then. Answer: While I do think school uniforms keeps some kids from feeling like their clothing isn't as good as others and vice versa I also feel like it erases a child's personal style and comfort. My oldest son would be very unhappy if he had to wear a uniform everyday as he likes to wear t-shirt and athletic pants a/k/a the "comfortable stuff". Answer: Yes I think teachers should be expected to wear shorts/skirts that are at least knee length, clothing that does not have vulgar, racial, or derogatory remarks and be a general positive role model to the children even when it applies to clothing. Answer: I think parents should be VERY involved in the education process. We are after all the parents of our children and we should be more concerned about our children's education as anyone. My children's education will never be as important to anyone as it is to me. Question: Can a parent be too involved in classroom matters? Answer: Yes I think parents can get too involved in classroom matters. There are times when a parent needs to let a teacher do their jobs and not be so involved. This definitely does not apply to all times as I think it is very rewarding for parents to help in the classroom. Question: What is an afternoon of homework like for your children? Answer: My children do their homework as soon as they come home from school. They may eat a snack but they are to immediately do their homework, before any tv or outdoor play. Answer: I think funds should be spend on making sure each and every child has the same opportunities in the classroom. It could also be extra help for the children who have a harder time and also providing more advanced work for the children who need it. Answer: I think schools should provide healthier options for the children. My children's school is currently providing fruits and/or vegetables for snack every afternoon and my children love it. Answer: I think music/arts is very important. I feel they are a way for children to express themselves and also build positive self esteem. Question: Do you attended all your child's school functions? Answer: I am not able to attend all functions due to my work schedule however when I only worked part time I did. That is one thing I really miss. Answer: I do think students have changed. I have been a substitute teacher for many classes at different schools and I don't remember students acting like they do now. Answer: I think the most annoying thing is when teachers, school staff, other students, etc. treat children differently because of who they are or are not. I can not say this has personally happened to me or my children but I have seen it happen. Question: As a parent, what is the single most important thing you try to teach your children? Answer: I try to teach my children to always be good to everyone and don't make fun of other people and to always try to be the best person they can be. Answer: I think teachers have a lot more resources available now due to technology. There isn't anything you can't find on the Internet. Question: What do you expected out of your children? Answer: I expect my children to do their very best in school. My children make very good grades but if for some reason they were to make a lower grade I would not be upset if I honestly thought they had tried their very best and worked their hardest. Question: What are your children's favorite subjects in school? Answer: My oldest son's favorite subject is math and history. My youngest son's favorite subject is math and spelling. Question: Do you think Pre-K is becoming a necessary part of the education system? Answer: Yes. My youngest son went to Pre-K and it was a blessing. He was so prepared for kindergarten and not just with educational knowledge, but he did not have any separation issues or problems making friends and being around other children when he started kindergarten. I feel like it helped to ease him into the daily routine. Great advice and wonderful wisdom, and they are especially timely for me since my little man is 20-months-old and soaking up everything me and my wife do around him.